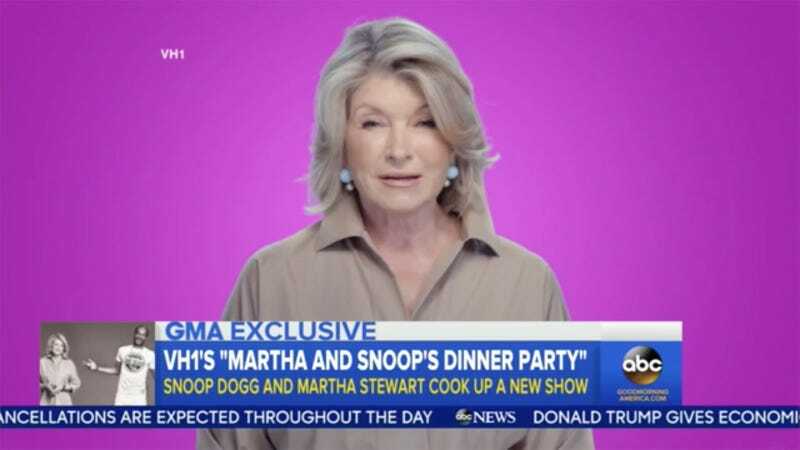 Old friends Martha Stewart and Snoop Dogg will soon be getting a VH1 series because the development process of cable networks in 2016 consists of two questions: 1) will people tweet about the series excitedly when it’s announced, and 2) will the series be easily clipped for our network’s YouTube channel. The show was announced this morning on Good Morning America, so if you’d like to hear the Queen of Facebook Live (god, I hope she doesn’t stop doing them) speak in Izzle (pro tip: you do), click play on the video below. Though this sounds like a fun idea on paper, keep in mind that Kocktails With Khloe did, too—until it stopped attracting celebrity guests that anyone cared about. Even personalities as charming and magnetic as Stewart and Dogg will need some good supporting characters to keep their show worth tuning into.